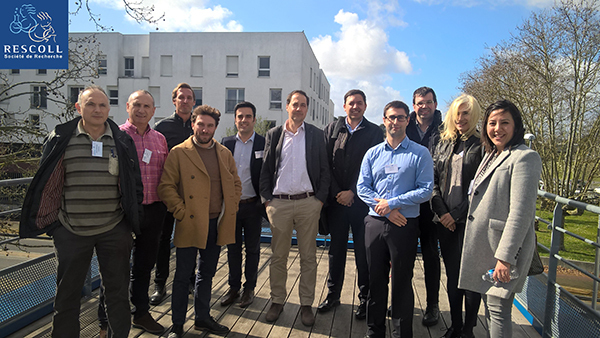 The monitoring meeting of the ECO-PROTECT project "Development of environmentally sustainable treatments for the protection of aluminium parts in the aerospace industry" took place at the RESCOLL premises on 7 March. The ECO-PROTECT project, approved in the Eurostars-2 tender, aims to develop and characterise Cr(VI)-free treatments for the protection of aluminium alloys used in the aerospace industry. These alternative treatments include pre-treatment, which will play a fundamental role in the use of these alternatives. Since there is no single solution for coating different shapes and applications, the development and verification of two coatings is proposed: firstly, a thin organic coating to protect complex shapes and, secondly, an organic chrome-free primer, applied by spray, to coat large parts. Both options must meet aerospace requirements, primarily for external applications. The project is led by the company, FINITEC ELECTRÓLISIS (Madrid), and includes the participation of the companies CHEMPLATE MATERIALS (Barcelona), RESCOLL (France) and STILZ-CHIMIE (France), as well as subcontracting by CTME (Miranda de Ebro) and CIDETEC (San Sebastián). The project, financed by CDTI in Spain (International Inter-companies programme) and BPI in France, has a budget of €1,506,880 and a project duration of 30 months.